The Ethiopian Empire (Tigrinya: ንጉሠ ነገሥት መንግሥቲ ዘ ኢትዮጵያ, Amharic: የኢትዮጵያ ንጉሠ ነገሥት መንግሥተ, Mängəstä Ityop'p'ya), also known as Abyssinia (derived from the Arabic al-Habash), was a kingdom that spanned a geographical area in the current states of Eritrea and Ethiopia. It began with the establishment of the Solomonic dynasty from approximately 1270 and lasted until 1974, when the ruling Solomonic dynasty was overthrown in a coup d'état by the Derg. Ethiopia's human occupation began early, as evidenced by the findings[which?]. It is believed that the ancient Egyptians claimed that Punt, known as gold country, was in Ethiopia in 980 BC. According to the Kebra Nagast, Menelik I founded the Ethiopian empire in the 1st century BC, around when the Axumite Empire was established. In the 4th century, under King Ezana of Axum, the kingdom adopted Christianity (Ethiopian Orthodox Church) as the state religion. It was thus one of the first Christian states. After the conquest of Aksum by Queen Gudit or Yodit, a period began which some scholars refer to as the Ethiopian Dark Ages. 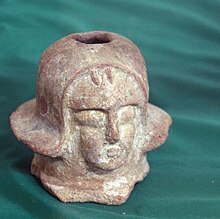 According to Ethiopian tradition, she ruled over the remains of the Aksumite Empire for 40 years before transmitting the crown to her descendants. In 1063AD the Sultanate of Showa describes the passing of their overlord Badit daughter of Maya. 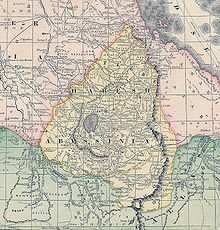 The earliest Muslim state in Ethiopia, the Makhzumi dynasty with its capital in Wahal, Hararghe region succeeds Queen Badit. The Zagwe kingdom another dynasty with its capital at Adafa, emerged not far from modern day Lalibela in the Lasta mountains. 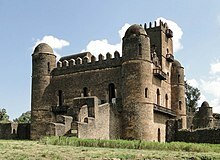 The Zagwe continued the Orthodox Christianity of Aksum and constructed many rock-hewn churches such as the Church of Saint George in Lalibela. The dynasty would last until its overthrow by a new regime claiming descent from the old Aksumite kings. In 1270, the Zagwe dynasty was overthrown by a king claiming lineage from the Aksumite kings and, hence, from Solomon. The eponymously named Solomonic dynasty was founded and ruled by the Abyssinians, from whom Abyssinia gets its name. 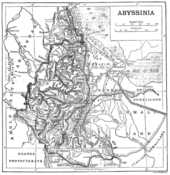 The Abyssinians reigned with only a few interruptions from 1270 until the late 20th century. This dynasty governed large parts of Ethiopia through much of its modern history. During this time, the empire conquered and annexed various kingdoms into its realm. The dynasty also successfully fought off Italian, Ottoman and Egyptian forces and made fruitful contacts with some European powers. In 1543, Emperor Gelawdewos beat Ahmad ibn Ibrahim al-Ghazi armies and Ahmad himself was killed at the Battle of Wayna Daga, close to Wegera. This victory allowed the Empire to reconquer progressively the Ethiopian Highlands. In 1559 Gelawdewos was killed attempting to invade Adal Sultanate, and his severed head was paraded in Adal's capital Harar. 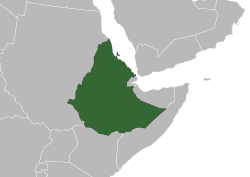 The Ottoman Empire, distated by the defeat of its ally Gragn, made another attempt at conquering Ethiopia, from 1557, establishing Habesh Eyalet, the province of Abyssinia, by conquering Massawa, the Empire’s main port and seizing Suakin from the allied Funj Sultanate in what is now Sudan. 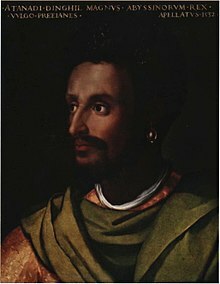 In 1573 Harar attempted to invade Ethiopia again however Sarsa Dengel successfully defended the Ethiopian frontier. The Ottomans were checked by Emperor Sarsa Dengel victory and sacking of Arqiqo in 1589, thus containing them on a narrow coast line strip. The Afar Sultanate maintained the remaining Ethiopian port on the Red Sea, at Baylul. Oromo migrations through the same period, occurred with the movement of a large pastoral population from the southeastern provinces of the Empire. A contemporary account was recorded by the monk Abba Bahrey, from the Gamo region. Subsequently, the empire organization changed progressively, with faraway provinces taking more independence. A remote province such as Bale is last recorded paying tribute to the imperial throne during Yaqob reign (1590-1607). By 1607, Oromos were also major players in the imperial politics, when Susenyos I, raised by a clan through gudifacha (or adoption), took power. He was helped by fellow Luba age-group generals Mecha, Yilma and Densa, who were rewarded by Rist feudal lands, in the present-day Gojjam districts of the same name. Susenyos reign was also marked by his short-lived conversion to Catholicism, which ignited a major civil war. His son Fasilides I reverted the move. The reign of Iyasu I the Great (1682-1706) was a major period of consolidation. It also saw the dispatching of embassies to Louis XIV's France and to Dutch India. During the reign of Iyasu II (1730-1755), the Empire was strong enough to undertake a war on the Sennar Sultanate, where the emperor leading its army to Sennar itself, was afterwards forced to reatreat upon defeat, along the Setit river. Iyasu II also confered the dignity of Kantibai of the Habab (northern Eritrea) after homage by a new dynasty. 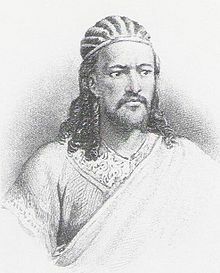 Emperor Tewodros II's rise to the throne marked the end of the Zemene Mesafint. Beginning in the 1880s, under the reign of the Emperor Menelik II, the empire's forces set off from the central province of Shoa to incorporate through conquest inhabited lands to the west, east and south of its realm. 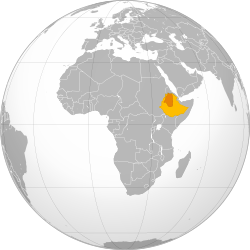 The territories that were annexed included those of the western Oromo (non Shoan Oromo), Sidama, Gurage, Wolayta, and Dizi. Among the imperial troops was Ras Gobena's Shewan Oromo militia. Many of the lands that they annexed had never been under the empire's rule, with the newly incorporated territories resulting in the modern borders of Ethiopia. 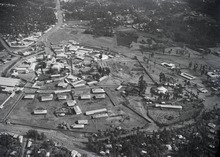 Delegations from the United Kingdom and France – European powers whose colonial possessions lay next to Ethiopia – soon arrived in the Ethiopian capital to negotiate their own treaties with this newly-proven power. In 1974 a pro-Soviet Marxist–Leninist military junta, the "Derg", led by Mengistu Haile Mariam, deposed Haile Selassie and established a one-party communist state. 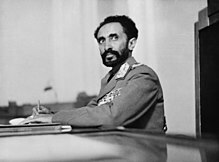 Haile Selassie was imprisoned and died in unclear circumstances, a rumor being that he was suffocated with an ether-soaked pillow. ^ "Ethiopia (1930-1975)". 16 January 2013. Retrieved 14 September 2016. ^ Nathaniel T. Kenney (1965). "Ethiopian Adventure". National Geographic. 127: 555. ^ Negash, Tekeste (2006). "The Zagwe Period and the Zenith of Urban Culture in Ethiopia, Ca. 930-1270 Ad". Africa: Rivista Trimestrale di Studi e Documentazione Dell'istituto Italiano Per l'Africa e l'Oriente. 61 (1): 120–137. JSTOR 40761842. ^ "Ethiopia Ends 3,000 Year Monarchy". Milwaukee Sentinel. 22 March 1975. p. 3. ^ "Ethiopia ends old monarchy". The Day. 22 March 1975. p. 7. ^ Henc van Maarseveen; Ger van der Tang (1978). Written Constitutions: A Computerized Comparative Study. Brill. p. 47. ^ "Ethiopia". The World Factbook. Central Intelligence Agency. 1987. ^ E. A. Wallis Budge (1 August 2014). A History of Ethiopia: Volume I: Nubia and Abyssinia. Routledge. p. 7. ISBN 9781317649151. ^ Oliver, Roland (1975). The Cambridge History of Africa, Volume 3. Cambridge University Press. p. 106. ISBN 9780521209816. ^ Braukhaper, Ulrich (2002). Islamic History and Culture in Southern Ethiopia: Collected Essays. LIT Verlag Münster. p. 21. ISBN 9783825856717. Retrieved 12 March 2017. ^ Richard Pankhurst, The Ethiopian Borderlands (Trenton: Red Sea Press, 1997), pp. 241f. ^ Akyeampong, Emmanuel. "Dictionary of African Biography". OUP USA. 1–6: 451. ^ Pankhurst, Richard (1997). The Ethiopian Borderlands: Essays in Regional History from Ancient Times to the End of the 18th Century. The Red Sea Press. p. 375. ^ John Young (1998). "Regionalism and Democracy in Ethiopia". Third World Quarterly. 19 (2): 192. doi:10.1080/01436599814415. JSTOR 3993156. ^ Haberland, Eike (1983). "An Amharic Manuscript on the Mythical History of the Adi kyaz (Dizi, South-West Ethiopia)". Cambridge University Press on Behalf of School of Oriental and African Studies. 46 (2): 240. Retrieved 18 December 2017. ^ Edward C. Keefer (1973). "Great Britain and Ethiopia 1897–1910: Competition for Empire". International Journal of African Studies. 6 (3): 470. doi:10.2307/216612. JSTOR 216612. ^ Jack, Ian (2001). Necessary Journeys. Granta. p. 124. ISBN 978-1-929001-03-3. "Abyssinia" . Encyclopædia Britannica. 1 (11th ed.). 1911. "Ethiopia" . Encyclopædia Britannica. 9 (11th ed.). 1911. "Abyssinia" . Collier's New Encyclopedia. 1921.